Have you ever eaten sun dried tomatoes? This recipe for smoke dried tomatoes creates something similar, but with a smokey flavor. Just about any tomato can be used, but remember. You can't turn a flavorless tomato into a tasty smoked tomato. Great tasting fresh tomatoes will make the best smoked tomatoes. 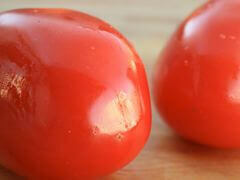 To prepare the tomatoes, halve them and remove the core and seeds. Leave on the skin. Season with just a bit of salt. Place them on the smoker grate skin side up, so liquid will drain out of the hollow. These need to smoke at a low temperature ... between 140 F and 160 F is about right. Light smoke is all these need. They can easily turn bitter if over-smoked. After the first couple of hours, begin to check them every half hour, rotating as needed, and removing the ones that are done. When finished, they will be leathery and pliable. Drying tomatoes concentrates the flavor, and with the bit of added smokiness, these are good! Smoked tomatoes are great as an addition to dips. I chop a handful, and mix into cream cheese, with just a bit of sour cream and fresh, chopped chives.